The SPI-MV is a single-point insertion electromagnetic flowmeter installed and calibrated in conjunction with a Singer valve to provide an accurate flow rate. 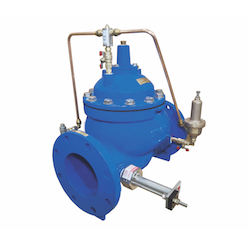 It is available for valve sizes from 4 to 36 in. With no moving parts and a single-piece design, the sensor contains nothing to wear or break, and it is generally immune to clogging by sand, grit or debris.